Over 100,000 books, CDs and DVDs will be for sale at Pequot Library's 58th annual summer book sale this month. The Connecticut Audubon Society is offering a Master Naturalist Woodland Program at the center at Fairfield. Those interested in expanding their knowledge of the habitats, plants, animals and natural history of Connecticut are encouraged to participate. Master naturalist training prepares people of all experience levels to become naturalists in their communities and to contribute to environmental education and conservation efforts through volunteer service. The Center at Fairfield’s program provides 40 hours of classroom and field training in four-hour sessions over 10 weeks. All sessions incorporate a mix of indoor classroom presentations and outdoor, hands-on field experiences. Class topics include introductory botany, geology, entomology, amphibians, reptiles, ornithology, mammals, marine ecosystems and interpretive guide techniques. There will also be a bird-banding demonstration and field study at Connecticut Audubon’s Birdcraft Sanctuary in Fairfield. Subjects are taught by field experts, including Fairfield ecologist/landscape architect Bill Kenny and James E. Biardi, director of environmental studies at Fairfield University. Audubon staff lead classes relating to the history of Connecticut Audubon and its education and conservation mission. At the conclusion of the training, graduates choose how to apply their knowledge and individual skills in volunteer capacities that help maintain and support education activities and operations at the center at Fairfield, or any other Audubon center. Classes meet on Tuesdays from Sept. 5 to Nov. 6, and Sept. 15 from 10 a.m. to 2 p.m. There is no class Sept. 25. Space is limited; registration deadline is Aug. 1. The fee for the 40-hour program is $250 for Connecticut Audubon Society members and $305 for nonmembers. As part of the tuition, participants must be able to contribute 10 hours of volunteer service within the year following the training. For information about the master naturalist program and the application, visit http://bit.ly/2MS71Qa or email cnoyes@ctaudubon.org. 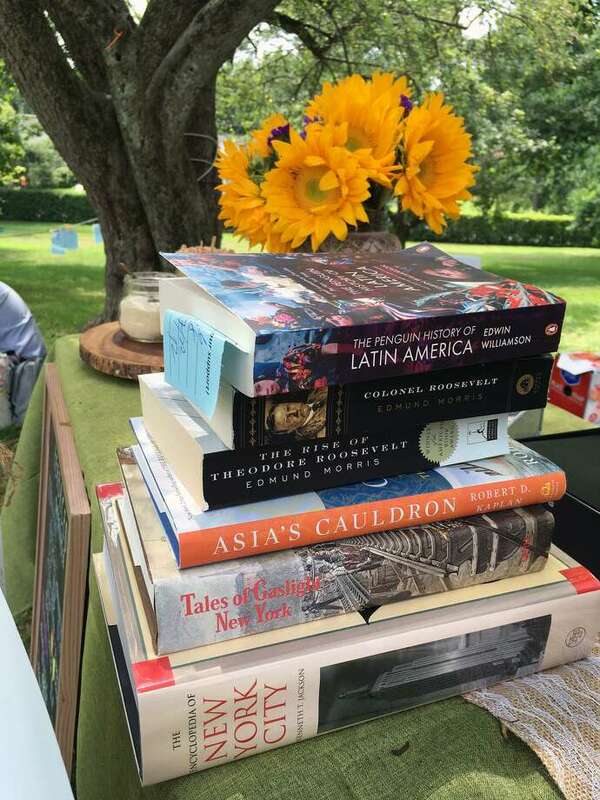 Pequot Library’s 58th annual summer book sale, one of the largest book sales in New England, will take place July 27 to July 30 from 9 a.m. to 6 p.m., and July 31 from 9 a.m. to 2 p.m, at 720 Pequot Ave. in Fairfield. Over 100,000 books, CDs, DVDs and records will be for sale. Admission is free, and proceeds fund Pequot Library’s annual programs and events for all ages. The Rowayton Arts Center announced the winners of the “Marine & Coastal” exhibit during its opening reception on July 1. The show featured artwork with a marine and coastal theme and included paintings, drawings, photos and sculptures. Award-winning artist and instructor Will McCarthy selected the winners from almost 80 entries. Fairfield residents Madeline Grella, Acacia Longley, Christian Sabella and Taylor Szemplinski graduated from Roger Williams University in May. Jonathan Burger, Jason Fromme and Carley Strachan, all of Fairfield, graduated from Ithaca College in May. The following Fairfield residents graduated from Loyola University Maryland on May 19: Sarah Arrigo, John DeMarco, Emma Dunleavy, Clara Love, Brendan Miner, Micaela Murphy, William Rhodes, Chelsea Scala, Michael Schweizer and Jeremiah Starke. The following Fairfield residents were named to the spring dean’s list at Lehigh University: Andrea Ranzilla, Morgan McCuaig, Meredith Nerreau, Jason Nerreau, Zachary Tieke, Nicole Vaccarella and Meaghan Gavey. Jessica Goddard, of Fairfield, was named to the spring Merrimack College dean’s list. Rebekah Snitkoff, Joseph Grosso, Patrick Salts and Christian Martin, all of Fairfield, were named to the Rochester Institute of Technology’s dean’s list for the spring semester. The University of Alabama named Fairfield residents Jackson Longley and Julia Josephine Palmieri to the dean’s list, and Devin G. Hall to the president’s list for the spring semester. Carley Strachan and Delilah Carey, both of Fairfield, were named to the spring semester dean’s list at Ithaca College. Fairfield residents Erika A. Leppla and Alexander A. Rigione were named to the University of Scranton spring dean’s list. The following Fairfield residents were named to the Marist College dean’s list for the spring semester: Caitlin O'Brien, Erin McCurley, Mary Gnibus, Charlotte Blatt, Seamus O'Rourke, Dylan O'Brien, Alexandros Alatakis, Jennifer Borjes, Olivia Mangan, Julia Mangan and Emily Henry.